Watch Despicable Me or buy Despicable Me 2 cheaply from Amazon. You too can earn money from writing articles by signing up for InfoBarrel. Despicable Me 2 sees the return of the bald, pointy noised villain Gru (Steve Carell, Seeking a Friend for the End of the World, The Incredible Burt Wonderstone). After adopting Margo (Miranda Cosgrove), Edith (Dana Gaier) and Agnes (Elsie Kate Fisher) in Despicable Me, Gru has now retired from the villain business. Instead, he is now a typical suburban dweller running his own business making jams and jellies as well as looking after the children. Well, typical if developing the jams and jellies in a secret lair underneath his house run by an evil research scientist, Dr. Nefario (Russell Brand), assisted by the Minions - the short, yellow, dungaree and goggle wearing one or two eyed Tic-Tac shaped creatures who almost speak comprehensibly and who fulfil a variety of roles for Gru - is typical. He also is trying to avoid the attempts by his neighbour Jillian (Nasim Pedrad) to set up on dates with a number of women she knows, and is also getting worried by Margo's growing interest with boys - like any normal father with a growing girl. Credit: http://en.wikipedia.org/wiki/File:Despicable_Me_2_poster.jpgA secret research lab has been stolen from the Arctic Circle by an unknown villain. In response the Anti-Villain League, run by its director Silas Ramsbottom (Steve Coogan, Alan Partridge: Alpha Papa, Night at the Museum: Secret of the Tomb), decides to recruit Gru - forcibly, using Agent Lucy Wilde (Kristen Wiig) to abduct him and take him to the AVL's submarine base - to help them. He was, after all, a villain before he gave it up and should therefore know how they think. Gru agrees to work undercover for the League, assisted by Lucy, who seems rather struck on him. Meanwhile, someone is abducting Gru's Minions, although he does have an awful lot of them. Despicable Me 2 is an animated film available in both 2D and 3D formats. The 2D format was the one watched. There is a lot of humour in the film from all the characters, but most notable are the Minions, with their destructive antics which often show an inability to get along with each other as well as some pretty short sighted behaviour and their almost intelligible speech, and the youngest girl Agnes who makes some pretty off the wall statements. Gru and Lucy should not be overlooked either, especially the interactions between them and, even though Gru may no longer be a villain, he still has some rather less than typical possessions - such as his Freeze Ray - which wouldn't be used by the average member of the public. Be sure to watch The Minion Movie Auditions in the closing credits - a Minions spin-off film is planned and this presumably relates to it - which features a number of Minions up to their normal antics. 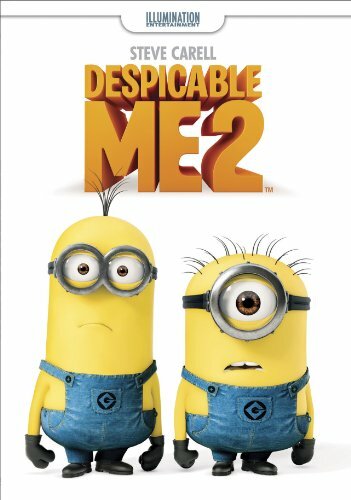 Despite being eminently suitable for children - as can seen by the U certificate the film has, the lowest certificate possible - Despicable Me 2 is still enjoyable, and recommended, for adults as well. I love those cute little minions! I'm looking forward to the minions film.